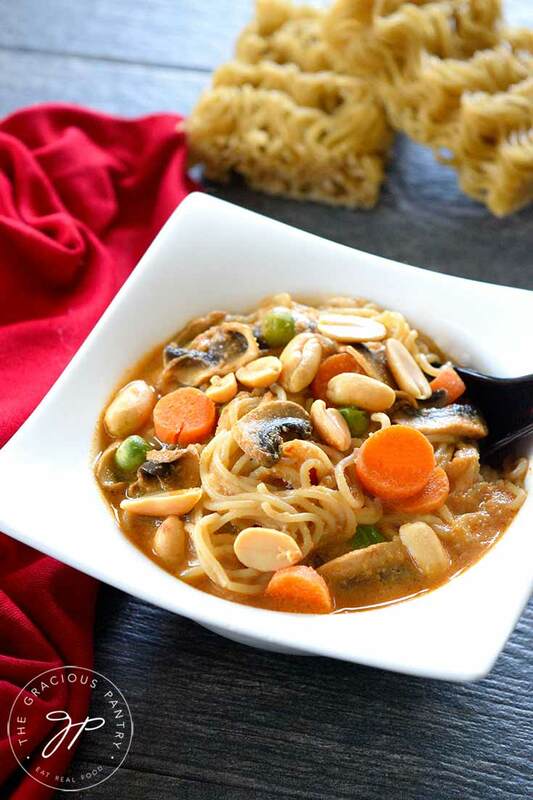 This Ramen soup recipe with a Thai flare is a great addition to your clean eating meal plan! So here’s the story. 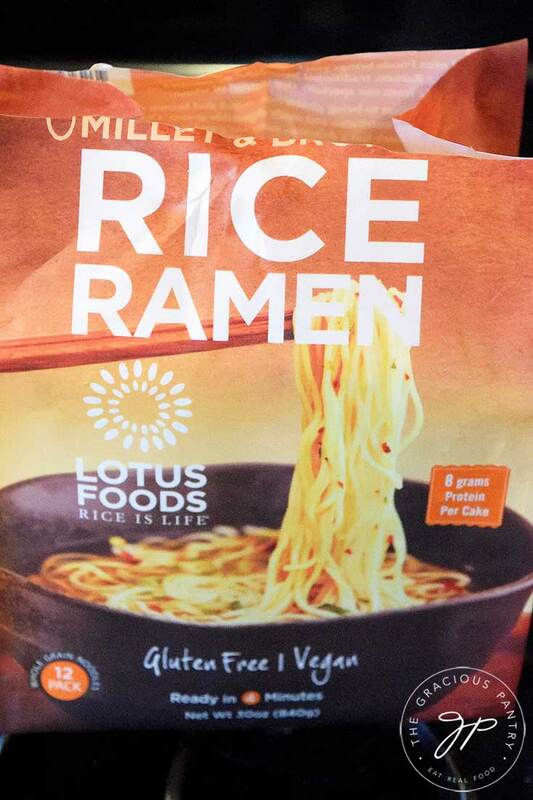 I was at Costco the other day, just wandering the aisles to see what all they had, and I came across a package of organic, brown rice and millet ramen noodles. I didn’t think such a beast existed! It was kinda pricey ($7.99), but the package had a lot of noodles in it. So I figured it was worth a shot. Many noodles equals many dinners! So the price will work itself out over time. I think I’ve had Ramen noodles at one other time in my life before I started eating clean. They were good, but definitely not clean. So finding this was a little exciting for me. I took that $7.99 package home with me and this is what I came up with. I still have many blocks of noodles in that package, so I’ll be doing more ramen recipes soon. But this was an excellent start! WHAT CAN I ADD TO RAMEN SOUP? For the most part, all additions are done for you in this recipe. But if you just want to make a simple ramen broth at some point in the future, you can add just about any vegetable you like. Some soy sauce (I prefer tamari) and even spicy things like peppers. The sky is pretty much the limit as it is with most soups. For this recipe, I used these ramen noodles I found at Costco. They are organic, gluten free and made with whole grains (brown rice and millet). But I’ve also seen people use udon noodles. You can even make your own udon noodles at home if you don’t mind working with a super tough dough. HOW DO YOU THICKEN RAMEN BROTH? You won’t need to thicken it in this recipe, but in general, you can use cornstarch or arrowroot powder. Adding things like full-fat coconut milk, as I did in this recipe, will also thicken things up a bit and make them creamier. This is the paste I used. 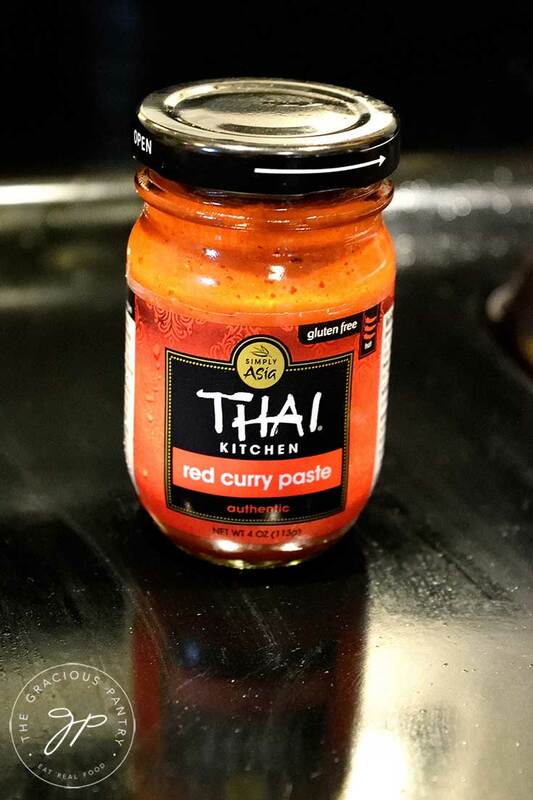 I found it at Whole Foods, but the Thai Kitchen brand is pretty universal. You can find it in a lot of stores or on amazon. Interested in making your own ramen noodles from scratch? Here’s a video on youtube on how to make ramen noodles. 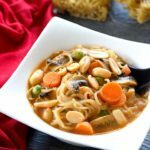 A delicious, hearty, creamy, Thai-flavored, ramen soup you can enjoy for dinner as well as lunch the next day! Bring everything to a boil and reduce heat to a medium simmer and cook until the mushrooms have wilted. Garnish with peanuts if you like. IMPORTANT NOTE!!! Do not put the cooked noodles into the large pot of soup. Store them separately and combine them only for eating. For this reason, you may want to make only the amount of noodles you can eat (about 1 block for 1-2 people) and then make more as needed to use up the soup. The noodles will become very mushy if stored in the soup. Store in fridge and keep for up to 3 days. This looks sooooooo yummy Tiffany!! Charlie – thanks so much! I certainly enjoyed it! Hope you and your family are doing well!